This is a “loving the leftovers” recipe. 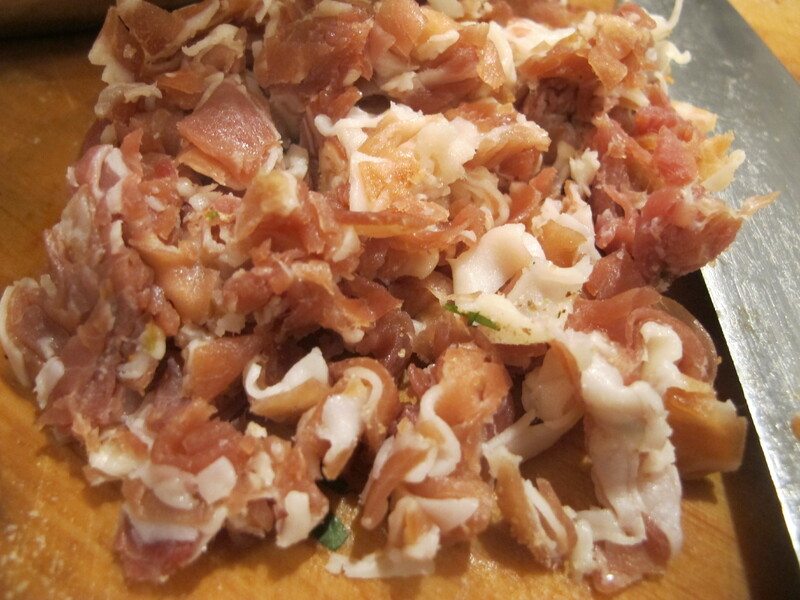 I had a couple of slices of veal that I hadn’t cooked when preparing saltimbocca alla romana the day before. I didn’t want to freeze them but they were not enough veal to satisfy our dinner requirements that evening. 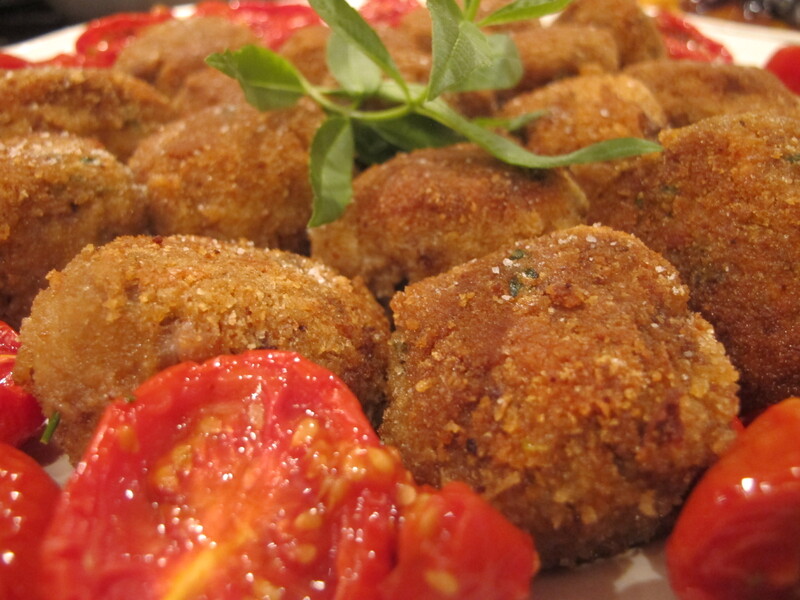 So … Patties – “polpette” – to the rescue. Why not? The freezer dredged up some peas; the fridge some grated parmesan and good butter. Plenty of breadcrumbs in the store cupboard. Garlic and olive oil never missing in my kitchen. A solitary egg. A glass of white wine. Some tomato sauce et voilà! Bob’s your uncle. Take a look. 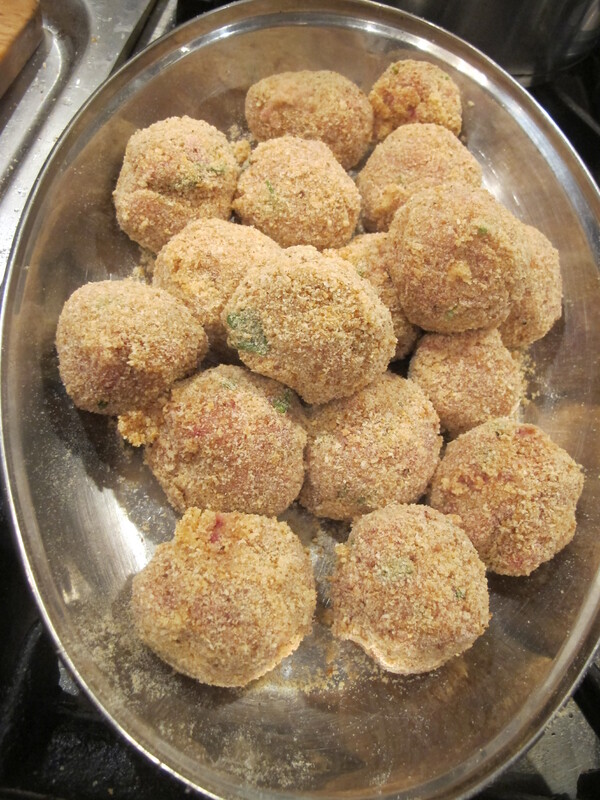 Place the veal, parmesan, peas and breadcrumbs in the processor. 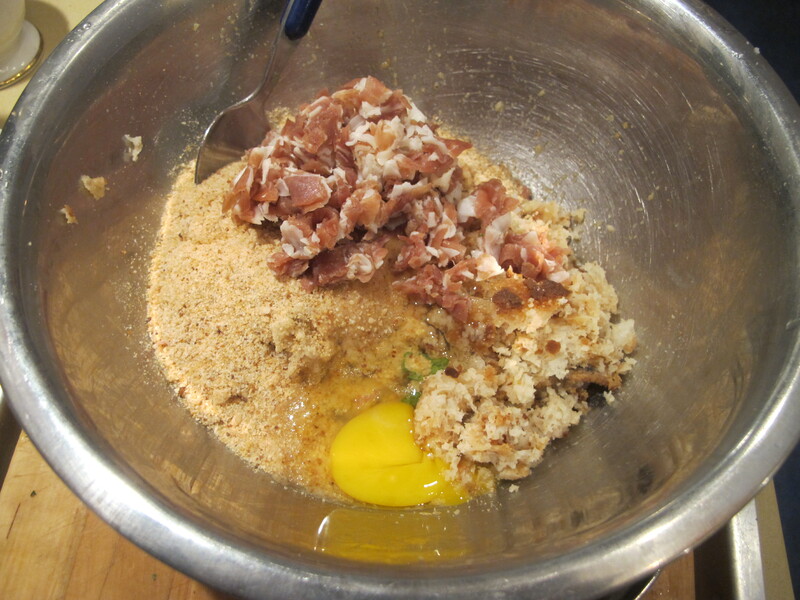 Add one egg, salt and pepper and blend. 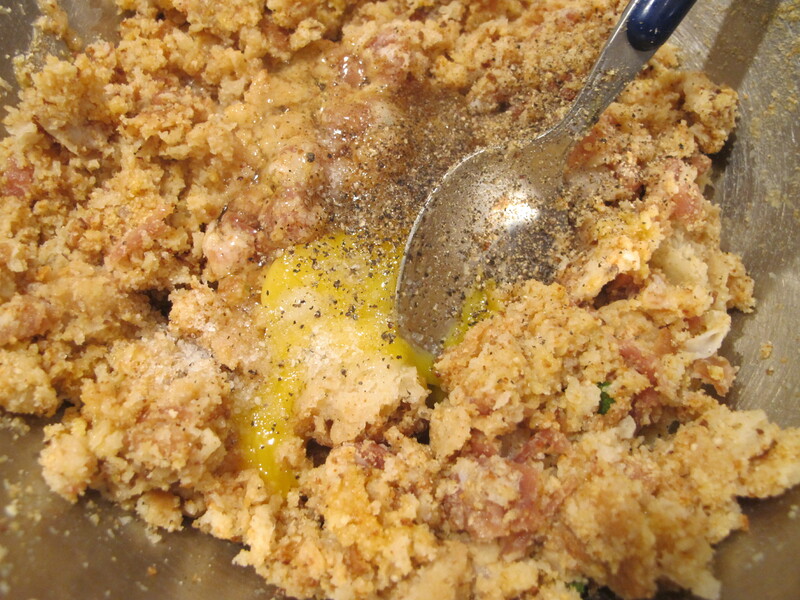 Add more breadcrumbs if necessary. 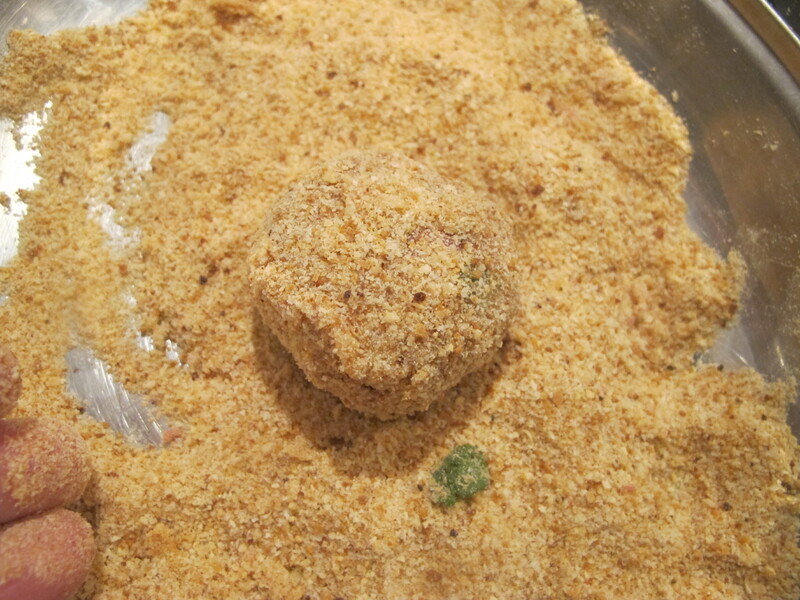 Shape the mixture into polpette, little balls. Pour a puddle of olive oil into a saucepan. Add a peppercorn (two if you prefer) and a couple of cloves of garlic. 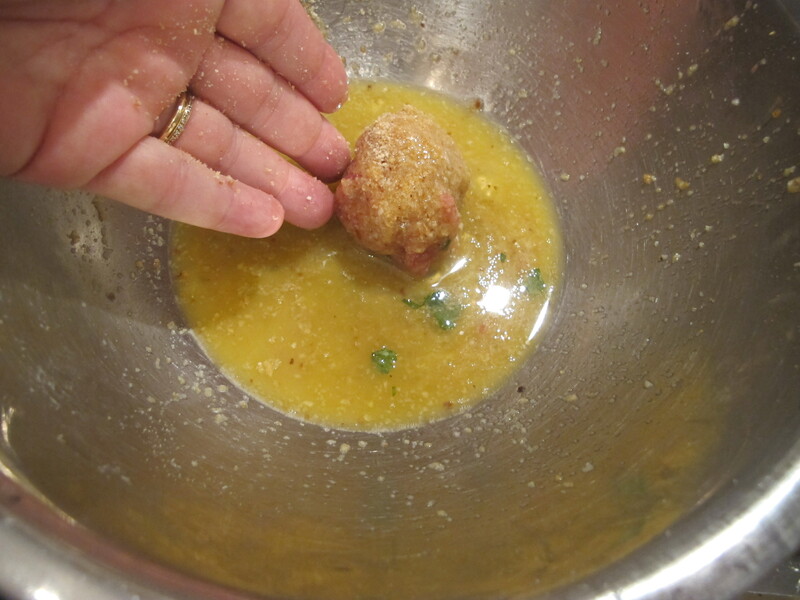 Remove from the pan when browned, but keep side for now together with some parsely, and start cooking the polpette. Add the parsley after a while. Put garlic back in (don’t if you don’t want to – some people like their garlic ‘light’, others more pronounced. I am mid-way and this way is mid-way). White wine comes next: pour some in and turn the heat up for a bit to make the alcohol evaporate. And now butter and tomato sauce. Salt too. Maybe a hint of sugar if the tomato is too tart. Cook for only a few minutes, over a fairly low heat. While the tomato sauce is simmering away, cook some more peas with a little butter. Then put everything on a serving plate and bring to the table. I suppose some fresh mint would have gone very well this this. Easy peasy no pun intended ha ha! I did not grow up eating Coda alla Vaccinara, the quintessentially Roman way of braising oxtail in tomato sauce and plenty of celery. I had it for the first time at my mother-in-law’s who must have learned to make it from a Roman since she herself hailed from the Marche Region, arriving in Rome as a very young bride of eighteen. 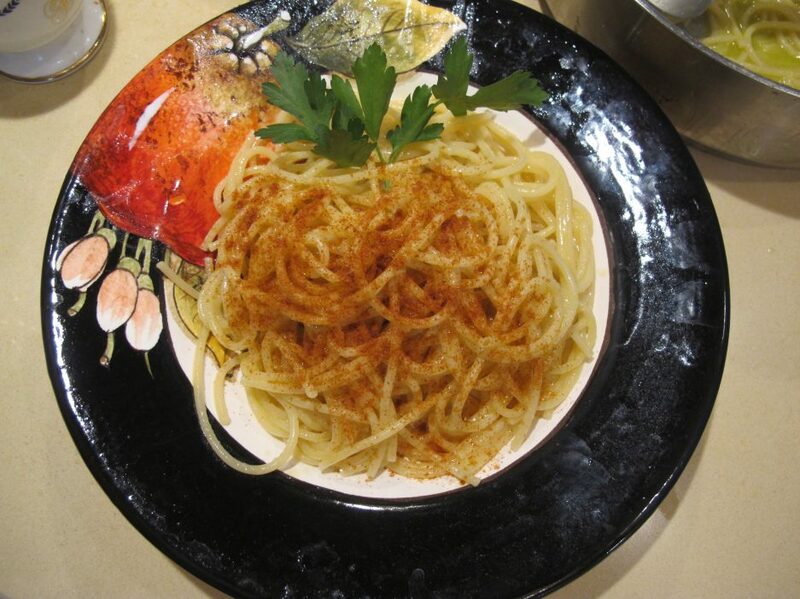 I loved the dish and the messy consequences of eating it – it is considered appropriate to gnaw on the knuckles (called ‘rocchi’ in Roman dialect) in order to extract every little bit of meat, and to mop up the sauce with an unjudicious amount of bread. Once the plate is bread-hoovered clean again, one can pronounce oneself finished, sigh, wipe one’s mucky hands and lean back in the chair. Aaaaaah. So much did I like Nonna Maria’s coda, that I very often asked her to make it for us whenever we’d go for dinner to their place. I didn’t even think to make it myself until about twelve years ago, asking Nonna Maria for instructions. She strongly recommended the use of a pressure cooker, for instance. By then, I had eaten it in various trattorias in Rome and thought Maria’s nicer on the whole – she was my coda benchmark. I had also been reading up on, and researching, all kinds of recipes and history of the Roman cuisine, and was quite taken aback to discover that raisins, pine kernels and chocolate (or cocoa) were considered ESSENTIAL to the REAL coda. Eventually, I prepared one myself, and rather liked it. I never strayed from adoring Nonna Maria’s version but put her recipe down to the fact that, technically, she had not been Roman born herself. And besides, versions are a good thing, and variety is the spice of life. When, in 2009, I was asked to host a special dinner in honour of Giovanni Vagnoni (pictured above), the wine producer of the Le Caniette in the Marche (www.lecaniette.it) at the behest of my gourmet and wine-loving friend Paolo Gherardi, (his partner is the beautiful Cinzia, on the left in the photo) I even put one solitary pinch of green cardamom powder in it the coda sauce that I used to garner some pasta. Paolo Gherardi on the right, friend Pierfrancesco on the left, somewhat pensive … or bemused? … at the same table. The mirth had definitely something to do with the lovely wines that Giovanni brought us to enjoy that evening. The mention of Venetian workers emigrating to Rome from up North was a very unusual anthropological take on this dish, and one that made me wonder deeply. I was, unfortuantely and however, in a huge hurry to get home and get on with making the dinner. So I asked the man to kindly give me his telephone number, and could we meet one of these days and discuss the matter further. I changed telephones a couple of months later and that’s how I lost his number, sigh. And that’s why I call him Mr Coda alla Vaccinara! I can’t remember his real name. I will definitely chase up on him one of these days. All this to say that … I too think it peculiar that bottom-of-the-rung labourers in the Testaccio slaughter house, so poorly paid that their salary was partly made up of cuts of meat that other people weren’t at all in love with, would have been able to afford the expense of chocolate or cocoa or pine kernels. Not unless they gathered the pine kernels from those beautiful trees that yes, do exist in Rome … but who is going to go and pick ’em? Raisins? maybe. But they would have been a luxury too, to be used in cakes or on special occasions. So, it is my speculation that it was only or mainly the wealthier Romans, starting with the clergy, who added these ingredients. The rest made do with celery which was both plentiful and inexpensive. That said, it is true that spices were indeed used in traditional Roman cuisine, including cinnamon and pepper and even coriander. Raisins and pine kernels are an integral part of many a Jewish recipe… so who knows? If Mr Coda alla Vaccinara is right, and that there were indeed labourers from the Veneto who brought riasins and pine kernels as additions to recipes … rhe mind boggles. 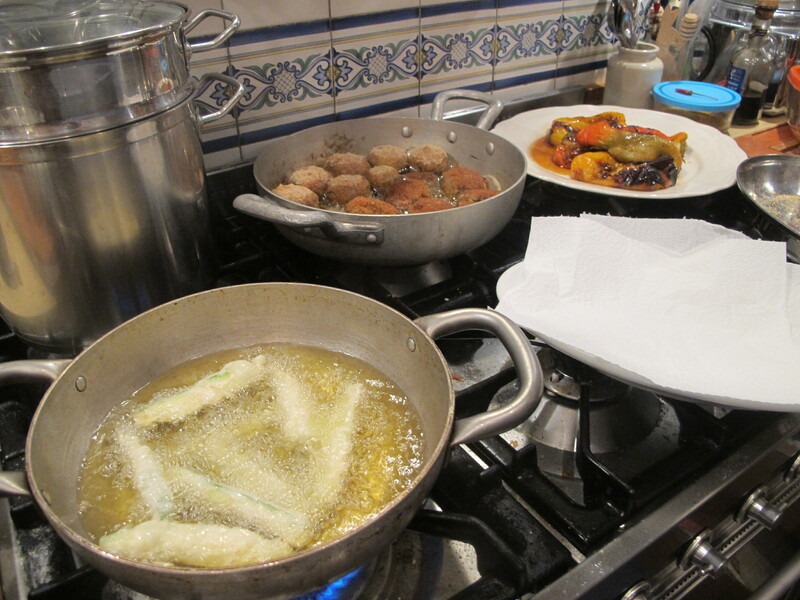 It is good to take stock of the fact that Venetian food itself owes a great deal to Jewish cuisine. And no, I am not telling tales about this tale! 🙂 Much of Roman cuisine too, if it comes right down to it, owes so much to Jewish cuisine that was brought from Sicily. Not that any of the above matters but … don’t you agree that the origins and developments of dishes and recipes are truly fascinating? The cheaper cuts of beef that the Romans use to make stock (il lesso) are often eaten either sliced up and accompanied by a ‘salsa verde’ or else reheated with onion and tomatoes for a dish called ‘picchiapò’ (https://myhomefoodthatsamore.wordpress.com/2012/09/28/picchiapo-pronounced-peek-ya-poh/) . 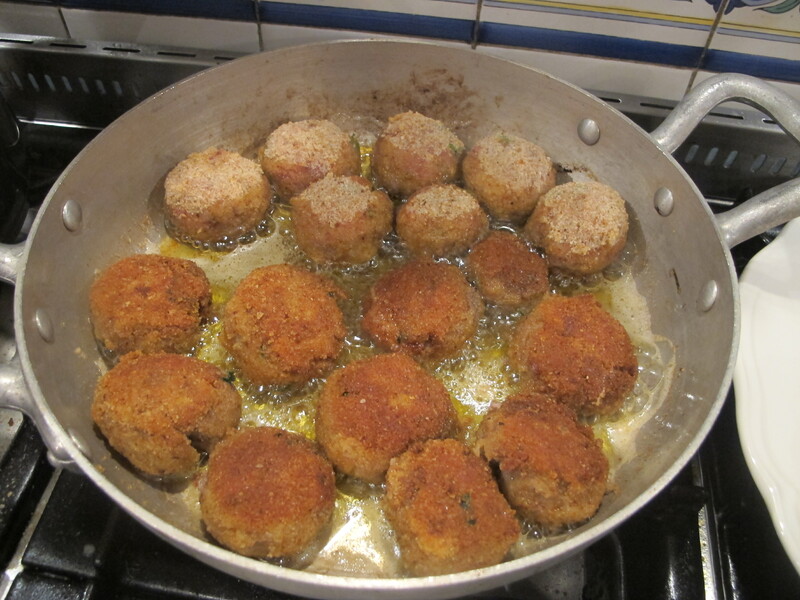 A third option is to mince up the meat and turn it into meatballs, which are breaded and quickly shallow fried (https://myhomefoodthatsamore.wordpress.com/2014/02/26/loving-the-leftovers-kale-fritters-and-stock-boiled-meatballs-riclico-di-cavolacci-fritti-e-polpette-dal-brodo/). They really do taste so much better than they sound, I promise you! and that is in part, I conclude. because of the contrast between the crispy outer coating and the soft interior of the meat patty. I had an ‘aha!’ moment the other day and thought to myself … ‘Why, I wonder whether we could make ordinary meatballs (i.e. polpette) taste like that too?’. Such is the low scale of my adventurous mind these days that it was with some trepidation that I broached the experiment. After all, the ‘normal’ Italian meatballs take pride in being as soft as a pillow … was it worth incurring the wrath of the Polpette Police ? 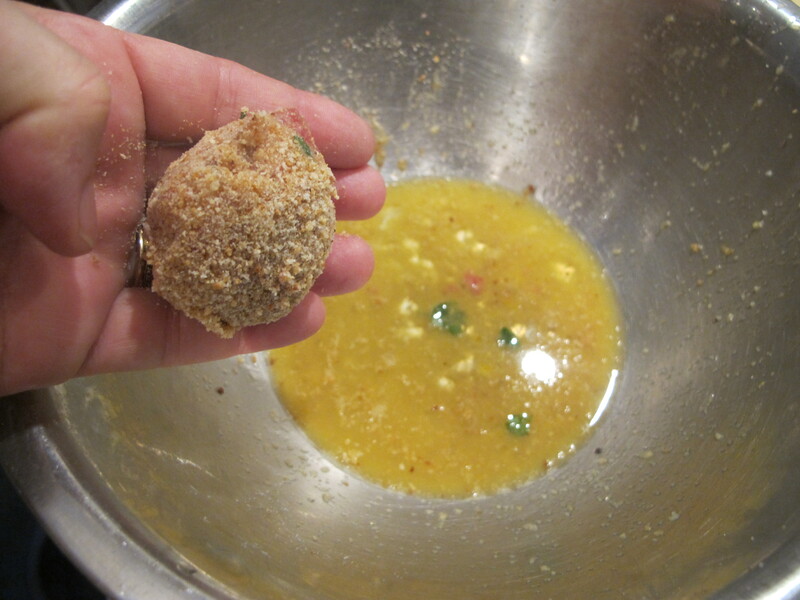 Dunk the meatball in egg wash (beaten egg) and then coat it with breadcrumbs a first time. The egg wash you see above had bits of choped parsely in it, it was just an added ‘thing’, you don’t have to follow suit. And then … repeat the process. 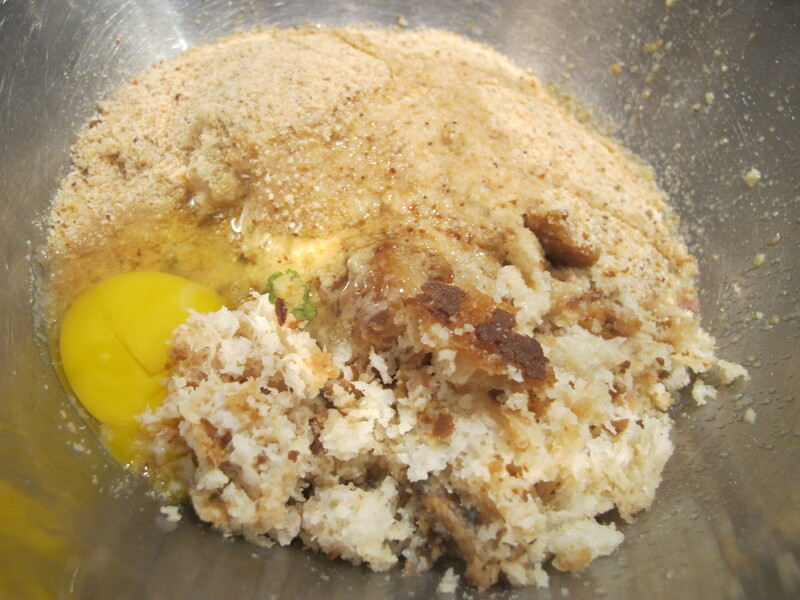 Dunk the polpetta a second time … And slather it in breadcrumbs a second time. Set aside. 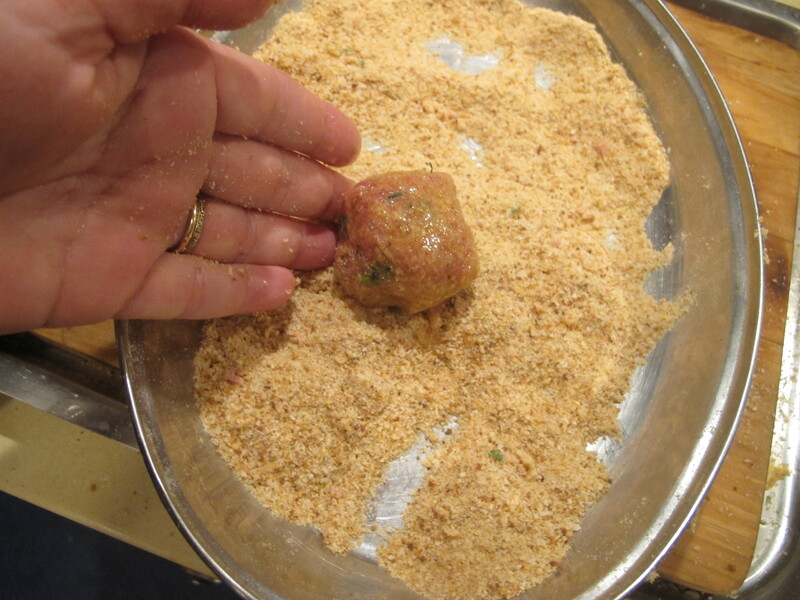 Shallow fry the polpette and low and behold … the two layers of breadcrumbs come into their own. I used olive oil for this procedure. 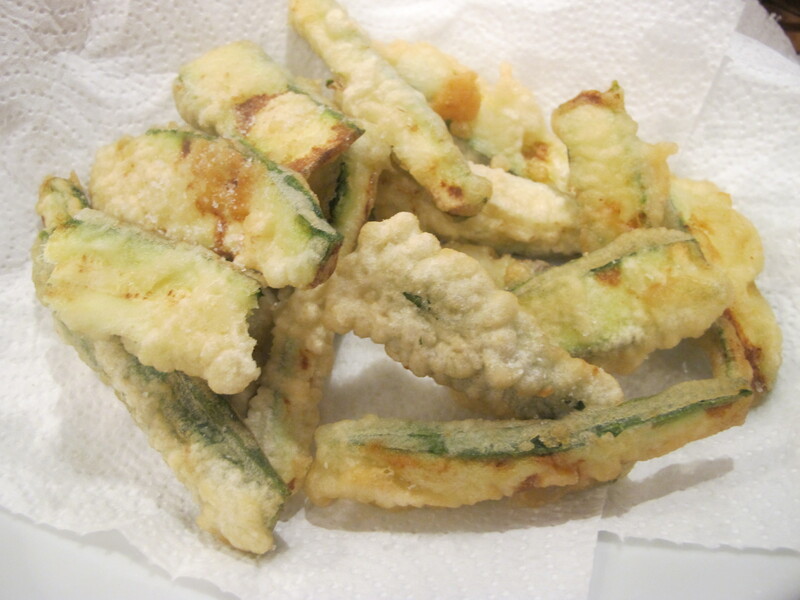 While I was cooking the polpette I was also frying some courgette slices in plain flour-and-water batter as a little antipasto. I had cooked the capsicum the day before in the oven. I had made some confit tomatoes the day before (together with the capsicum). 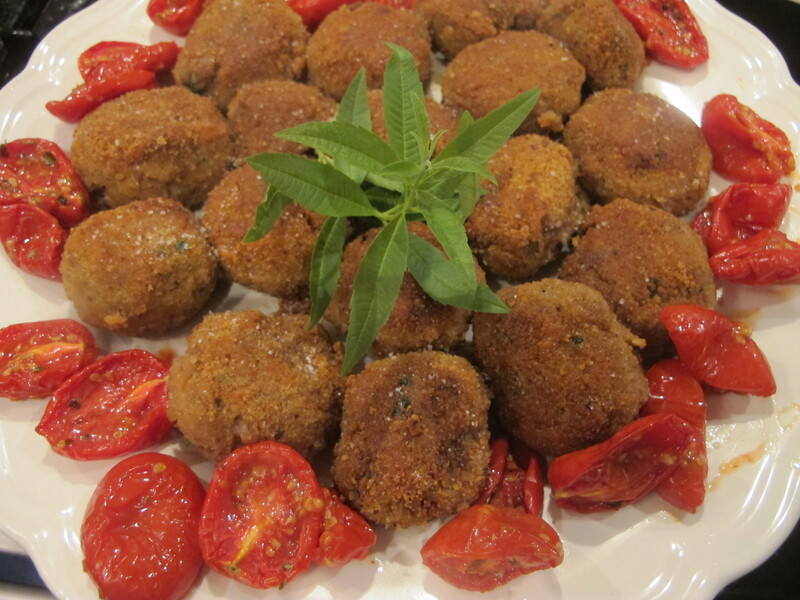 And here are the pert and crispy polpette resting inside a wreath of oven cooked tomatoes. A good sprinkling of salt … always (and make sure it’s air dried salt, not nasty chemically dried table salt). And Bob’s your uncle ! They were really good, I mean really good (they all got gobbled up, that’s always an indicative sign). I had some prosciutto languishing in the fridge. I felt sorry for it. So I turned it into polpette too. The texture was naturally completely different from the above, but it proved a viable experiment … and one in keeping with my ‘Loving the Leftovers’ lark. That’s it. 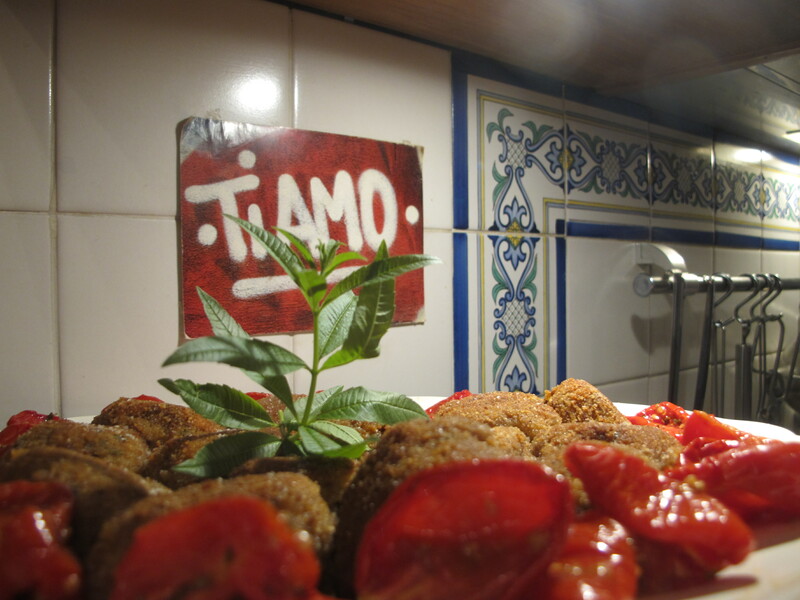 Polpette can save the day … and always taste good !